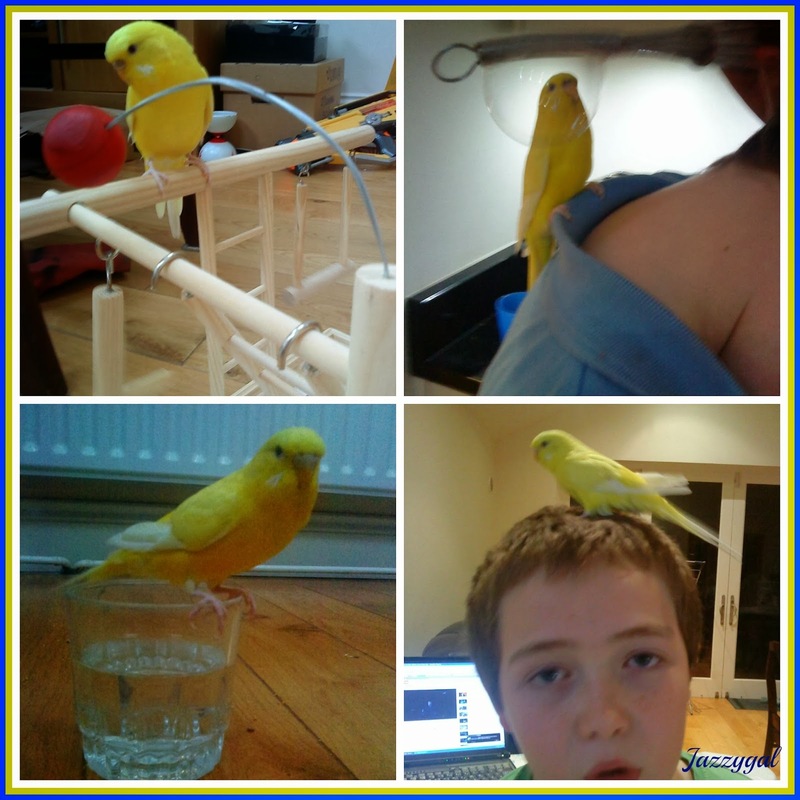 It's almost 4 years since a little ball of yellow fluffy feathers, tinged with white, flew into our lives. They were best buddies from the beginning. 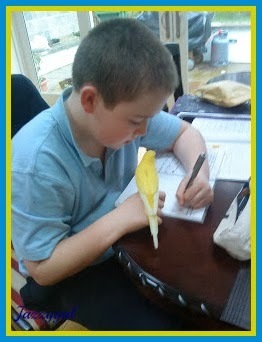 His cute and gentle budgie-ness matching the pending teen boy's burgeoning tenderness. 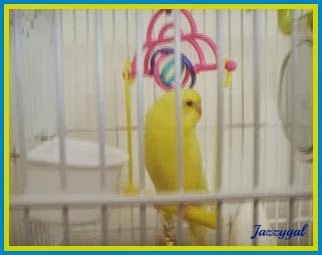 Sunny made himself quite at home and loved his cage, especially his swing. His favourite place to tuck himself in at night. He enjoyed being out in the garden during the summer, listening to and mimicking the tweets of his birdie brethren. He also liked to share my daily lunch time 'Home and Away' treat with me, and always tweeted like mad during it. He could hear the background birds, possibly including other budgerigars, tweeting away gently. His home country calling to him perhaps?! Then there was the time I helped him get his own back! I noticed him making a strange noise recently and eventually concluded that he was mimicking a bird on our chimney. He was cradled and petted - prompting much disinfecting afterwards!- by the caring teen before and after our attempted emergency trip to the vet, which had to be aborted half way. 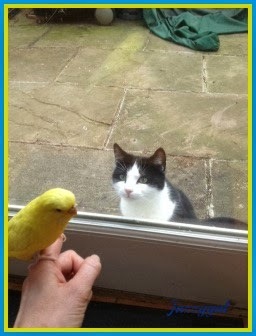 Our gorgeous Budgie-Boy Sunny had breathed his last. We were very, very sad. We will never again hear his tweets, his little utterances of 'good boy' or 'budgie boy' or even 'dirty bum'! Death and dying are part of living. Most certainly part of living with pets. We must learn to deal with it in our own way, as best we can. A suitable box was procured and a burial place selected and dug. He was lovingly placed there, buried with another favourite toy. I was merely the assistant. A subsequent Midterm trip to the Gardening Centre resulted in the purchase of some very pretty flowers. 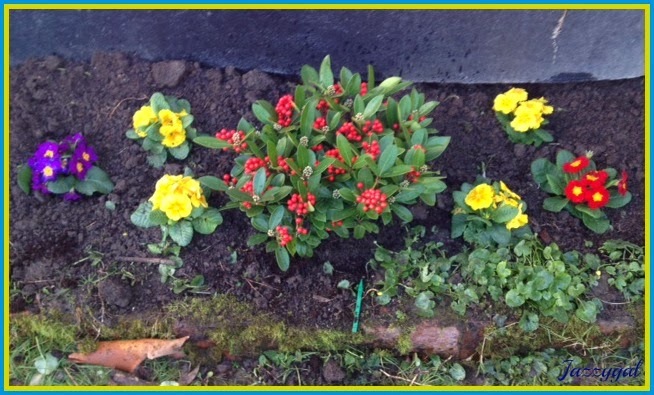 We couldn't get the preferred yellow for our centre piece as its a shady spot. In time the berries will be replaced with flowers, tinged with white, and they will be surrounded by yellow fluffy Primroses. And it will always be Sunny in the Shade. @Sadbh: Thanks Sadbh. We had budgies growing up too and I loved them. My boy really loved this one too, there may be a replacement in the not too distant future! @mum in meltdown: You get so attached to them, don't you! He was very upset but coping well. Part of life and I think we handled it well. He very musch wanted to be part of burying him. @Looking for Blue Sky: Thanks, yes we really are missing him. Oh, this is so sad. As I have discovered, the attachment to pets is so strong... and very heartbreaking when they pass on. I love his resting place, very pretty. @Bright Side of Life: And we don't don't realise how strong until they're gone!